When it comes to backyard landscape design, the phrase, “business in the front, party in the back” applies. Although we don’t want to compare your yard to a mullet haircut, the back of your yard – and for that matter, any part of your property that doesn’t face the street – is where you can use a more casual approach to landscape design and plans. 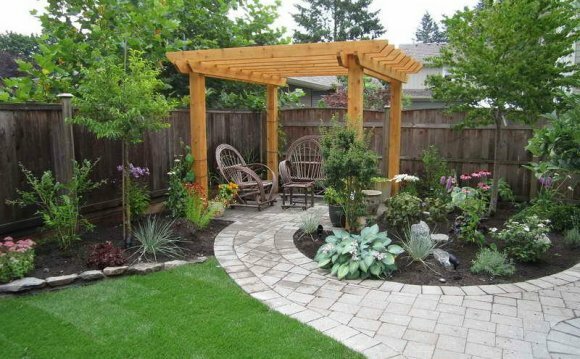 Consider backyard areas to be a blank canvas for exploring garden projects or even creating multiple hardscapes where little plant life (and maintenance) is needed. While the front yard landscaping typically adheres to the same architectural style as the back of your home, backyards can be anything you want them to be. When drawing up plans for the landscape design of your backyard, size and topography are the most important considerations. If your backyard is large and flat with few trees, perhaps you’d love to sod or sow it with a low-maintenance groundcover such as Bermuda grass and then focus on small gardening projects closer to your house structure. (Potted geraniums are perfect for summer spice and pansies are fabulous for fall flair.) A flat, open space can be divided into zones and assigned a purpose (i.e., summer vegetable garden, sitting area with bench, natural flower patch, English garden with hedge, etc. If too many pesky pine trees and their trails of cones and straw are getting in the way of your visions for a backyard full of flowering shrubs and full-sun perennial flowers, remember you can always cut down old trees and plant new ones. If your backyard is on a hill, fencing and retaining walls can be great additions to your landscape plan. Embankments above retaining walls make great spaces for beautiful spreaders such as liriope, which stays green in the winter and sprouts purple buds in the spring. For rocky terrain, flowers that enjoy the company of pebbles and stones work best. Try dianthus or alyssum for rocky soil areas. For drier terrain, hardy shrubs such as bee brush and flame honeysuckle can be your best friends. Small backyard spaces can be manicured so beautifully (if looking for inspiration, just keep in mind what city dwellers do with tiny rooftop and balcony spaces) that size truly doesn’t matter. You may create a strip of grass surrounded by pencil hollies or a fence draped in ivy or simply fill every available inch with your favorite annuals. Or perhaps you’d rather go natural with stonework and pavers and sprinkles of violets? Either way, a small backyard can be a big asset! It’s true that “anything goes” in backyard landscape design. Don’t be afraid to try new ideas in your backyard. Just remember that your backyard is part of your home’s overall curb appeal, even if it isn’t in view to every car or jogger passing by. Have fun, but keep it pretty.